Modern portfolio theory assumes that the relation between risk and return is a linear line and investors increase their required rates of return as perceived risk increases. During periods of slackening economic activity i.e. recessions, rational investors’ expectations of return per unit of risk increases. There is a preference for low risk assets during these times as investor risk appetite falls and flow of funds is skewed towards low risk assets such as USD, gold and treasury bills. This long term faith of rewarding investors with higher risk appetite with risk premium is put to test in recent times. Traditionally, gold, US dollar, commodities and treasury bills were/are considered to be safe haven assets, meaning their volatility was lesser compared to equities. Hence a person investing in gold for example, will have to be compensated less when compared to an investor investing in equities. In other words, the risk premium for gold should ideally be lesser than the risk premium for equities. A study of various asset class performances over the last five years, while offering support to the above intuition, provides other counter intuitive results. 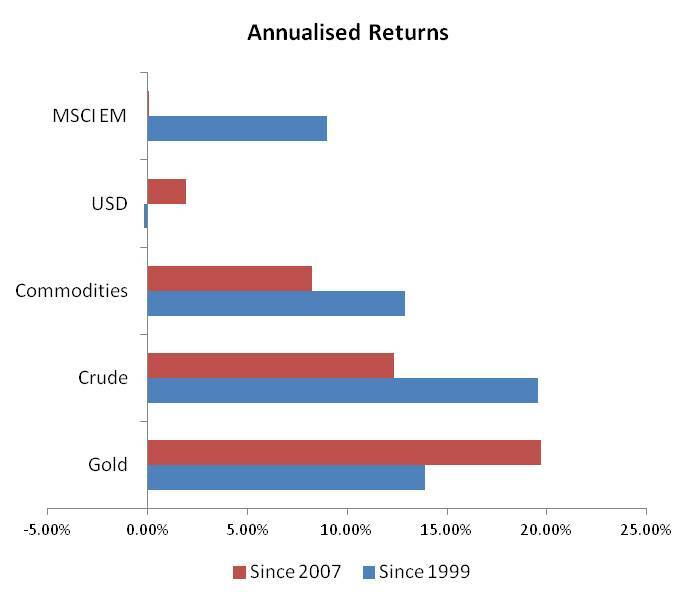 Results in favor of the theory are - USD has been the worst underperformer among assets such as Gold, Crude, commodities, and emerging markets over the past ten years. 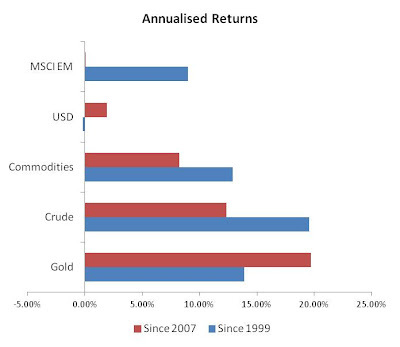 Counter intuitive results are as follows - Over the last 10 years, gold has been offering positive returns irrespective of the economic activity. Returns from the asset ranged from 5% to 30%. Considering real interest rates of 1% (rate of return of short term government bonds in U.S. markets which are considered to be really risk free), the risk premiums for gold have been between four percentage points to 29 percentage points. Another result has been that emerging market equities have performed in line with traditionally low risk assets such as commodities and crude oil. In other words, the risk premiums for crude and commodities have been in line with those of emerging market equities. Possible explanations to this behavior can be two sided (paradoxical though) – one, equities have become less risky, or that assets once considered safe are no longer so. Volatility, a measure of riskiness of an asset shows that emerging market equities have continued to be risky compared to commodities and gold. 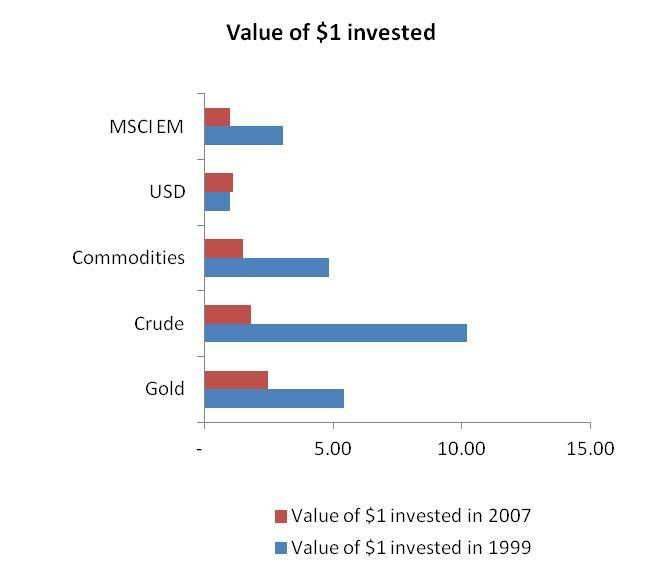 The rate of increase of volatility of commodities and gold compared to emerging market equities is lesser. The annualized standard deviation of commodities (as measured by Thompson CRB Index) over 25 year time span has increased from 6.52%, to 9.82% over the last 5 years, gold from 17.69% to 21.27% over similar time periods, while equities have increased from 18.53% to 26.06%, indicating that equities continue to remain risky above commodities and gold. Central banks have three key tools – one, stimulate demand in the economy through government borrowing and spending and two, monetary easing, lowering interest rates to near zero levels, three, printing or electronically creating currency and increasing liquidity in the economy. The recent bailout of Greece by Euro nations, AIG by U.S. government, have created a trust among global investors that central banks and governments will not let assets fall in value. This means that investors with such risky bets will keep the gain while losses will be covered by the central bank. Performances and valuations of assets such as gold, commodities and recent IPOs such as Facebook indicate that cash flows are towards speculation and away from traditional assets. In addition, analogs of money such as derivatives, mortgage backed securities and tulip bulbs add to the speculative chaos. These new norms have resulted in money flow into assets such as crude, commodities and emerging markets. Making it cheaper is also a good way of making business. You just have to sell more items to recovers from the cost incured in this kind of strategy.